According to modern portfolio theory investors can pick a trade-off between expected returns and volatility along a certain curve. If someone is investing for the very long term (decades until retirement): Is it a good idea to pick a very extreme high-return/high-volatility point? It seems that this strategy maximizes returns while still guaranteeing reasonable volatility in the long term because the wild swings will average out. So basically, pick the highest-returning asset class that is available (e.g. startup funds and oil drilling ventures) and hold the assets a few decades. This is basically what financial advisers have been saying for years...that you should invest in higher risk securities when you are young and lower risk securities when you get older. However, despite the fact that this is taken as truth by so many financial professionals, financial economists have been unable to formulate a coherent theory that supports it. By changing the preferences of their theoretical investors, they can get solutions like putting all your investments in a super safe asset until you get to a minimum survival level for retirement and then investing aggressively and many other solutions. But for none of the typically assumed preferences does investing aggressively when young and becoming more conservative as you near retirement seem to be the solution. I'm not saying there can be no such preferences, but the difficulty in finding them makes me think maybe this idea is not actually correct. It's not clear that things "average out" over time. If you lose a bunch of money in some asset, there's no reason to think that by holding that asset for a while you will make back what you lost--prices are not cyclical. Moreover, doesn't your intuition implicitly suggest that you should transition out of risky securities as you get older...perhaps after having lost money? You can invest in safe assets (or even better, the tangency portfolio from your graph) and then lever up if you do want higher risk/return. You don't need to change your allocation to risky assets (and it is suboptimal to do so--you want to move along the CAL, not the curve). The riskiness of your portfolio should generally coincide (negatively) with your risk-aversion. When you are older and more certain about your life expectancy and your assets, are you exposed to more or less risks? In many cases, less risks. This means you would choose a more risky portfolio (because you are more sure you will have enough to live on until death even if your portfolio takes a dive). Your actual portfolio consists both of your investments and your human capital (the present value of your time and skills). When you are young, the value of this capital changes significantly with market performance so you already have background risk. Buying risky securities adds to that risk. When you are old, your human capital is worth little, so your overall portfolio becomes less risky. You might want to compensate by increasing the risk of your investments. EDIT: Note that this point may depend on how risky your human capital is (how likely it is that your wage or job prospects will change with the economy). Overall the answer to your question is not definitively known, but there is theoretical evidence that investing in risky securities when young isn't optimal. Having said that, most people do seem to invest in riskier securities when young and safer when they are older. I suspect this is because with life experience people become less optimistic as they get older, not because it is optimal to do so. But I can't be sure. 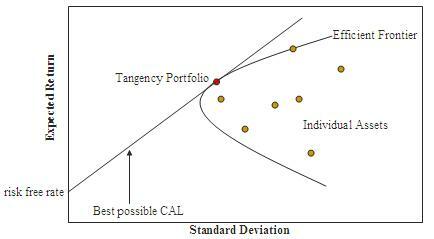 Modern portfolio theory has a strong theoretical background and its conclusions on the risk/return trade-off have a lot of good supporting evidence. However, the conclusions it draws need to be used very carefully when thinking about retirement investing. If you were really just trying to just pick the one investment that you would guess would make you the most money in the future then yes, given no other information, the riskiest asset would be the best one. However, for most people the goal retirement investing is to be as sure as possible to retire comfortably. If you were to just invest in a single, very risky asset you may have the highest expected return, but the risk involved would mean there might be a good chance you money may not be there when you need it. Instead, a broad diversified basket of riskier and safer assets leaning more toward the riskier investments when younger and the safer assets when you get closer to retirement tends to be a better fit with most people's retirement goals. This tends to give (on average) more return when you are young and can better deal with the risk, but dials back the risk later in life when your investment portfolio is a majority of your wealth and you can least afford any major swings. This combines the lessons of MPT (diversity, risk/return trade-off) in a clearer way with common goals of retirement. Caveat: Your retirement goals and risk-tolerance may be very different from other peoples'. It is often good to talk to (fee-only) financial planner. Modern portfolio theory dramatically underestimates the risk of the recommended assets. This is because so few underlying assets are in the recommended part of the curve. As investors identify such assets, large amounts of money are invested in them. This temporarily reduces measured risk, and temporarily increases measured return. Sooner or later, "the trade" becomes "crowded". Eventually, large amounts of money try to "exit the trade" (into cash or the next discovered asset). And so the measurable risk suddenly rises, and the measured return drops. In other words, modern portfolio theory causes bubbles, and causes those bubbles to pop. Invest in dividend-oriented stocks, based on your best guess at the company's likely long-term growth over the next ten years plus the company's dividend rate, subject to the companies' price/earnings growth (PEG) ratios being acceptable to you. Sell if/when you lose confidence in management's ability to deliver either long-term growth or steady dividends. Systematically rotate between sectors, trying to be in the sectors that the hot money is moving into, instead of the sectors that the hot money is moving out of. Systematically re-balance your portfolio each year, trying to take profits on last years "hot" sectors and trying to re-invest in hopefully undervalued sectors. Not the answer you're looking for? Browse other questions tagged investing rate-of-return volatility or ask your own question. What is the theory behind diversification? Why does it work? How do I annualize returns for less than one year? Average performance for long term stock investors?